At the dojo yesterday, I got to partner with Sensei for the last round. I NEVER get to do that. In the six years I’ve been doing his classes, I think that’s only the third time. 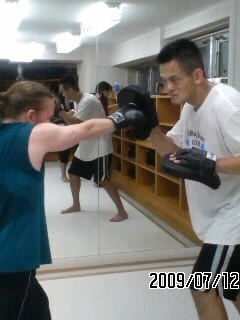 Anyway, we were doing a one-two, upper, straight combination, and Sensei gradually kept raising the mitt higher for the uppers. Like everyone else, he’s a good bit taller than me, and toward the end of the round, he was holding the mitt over his head. I had to jump to get up high enough to hit it, then deliver the straight punch before my feet hit the ground. It was tough, but very Jackie Chan. This isn’t him, it’s Takahashi-kun, but I like this picture.